When it comes to hidden gems, historic Westport House is a real treasure trove of fascinating cultural nuggets, charming ephemera and nooks and crannies to explore. To whet your appetite, here are a five for you to find on your next visit. 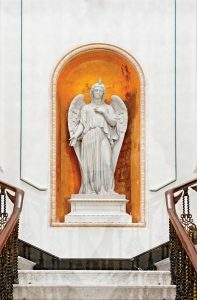 As you enter the stunning entrance hall of Westport House, your eyes will be drawn to its biggest presence: the magnificent Angel of Welcome. Children often mistakenly think she might be a ‘magical unicorn angel’, as it looks as though there’s a horn is growing from the top of her head. However, this is not where her magic lies (the horn is, in fact, a flame representing the Holy Spirit). Her powers are much more subtle: Touch her hand, and you’ll be sure to come into some luck, and perhaps some prosperity too. 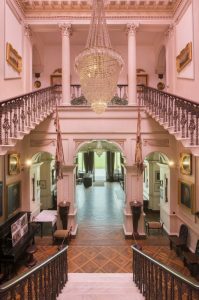 On entering the large dining room, visitors are often overwhelmed by the ornate ‘Wedgewood’ walls and ceiling and the incredible Howe Peter-commissioned sideboards. 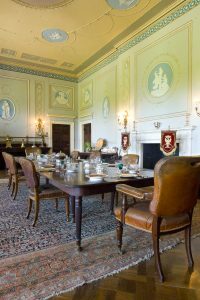 However, take a moment to contemplate the ornate 19th-century fire screens (or ‘pole screens’) on either side of the fireplace, each bearing the eagle of the Browne family crest. From the 17th to the 19th centuries, both men and women wore wax-based facial makeup to hide unsightly blemishes. Sitting too near a fire was a risk, as your makeup could literally start to melt and slide off. This is where the expression ‘to lose face’ came from. The screens, were therefore all important, allowing one to ‘save face’ – and avoid a lot of embarrassment. The keen-eyed visitor will notice three unusual doorstops – namely, two horses hooves, and an ostrich foot. The two horses hooves are rather bizarre tributes to favourite horses of the estate – one called Rory, who was 13-and-a-half hands tall and lived from 1880 to 1886, and another called Pink ’Un. We don’t know as much about Pink ’Un, only that he died in 1900, but his name may have been inspired by Sherlock Holmes story ‘The Adventure of the Blue Carbuncle’, which was published in 1882. We can only speculate as to the provenance of the ostrich-foot doorstop. Perhaps the colourful Second Marquess of Sligo, Howe Peter Browne – who liked to collect unusual trinkets – spotted it on his travels and just couldn’t resist. Look out for the two very worn-looking flags on either side of the pillars at the staircase. These are British Regimental flags dating back to the 1800s. How they came to be in the house is a mystery. As for their ragged state, we do know that in St Patrick’s Cathedral in Dublin, they would let the flags hang until they disintegrate to represent a soldier’s life. The tradition may be rooted in the old British soldiers’ folklore song that contains the lyric ‘Old soldiers never die, They simply fade away’ – a line that was later made famous by General Douglas MacArthur uttered it in his April 19, 1951, farewell address to the US Congress. Miser purses – also called long purses, stocking purses or ring purses – were popular from the mid-8th century through the early 20th century, and several wonderful examples can be found . Long, narrow and tubular, they were used by both men and women for carrying coins, with men sometimes opting to hide them up their sleeves. Some scholars believe that were called ‘miser purses’ because they were made to disgorge a single coin or just a few coins at a time, or because the design ensured that coins were secure and difficult to lose. Others believe the design of the purse was a revival of the Medieval practice of carrying one’s coins in the toe of a stocking. 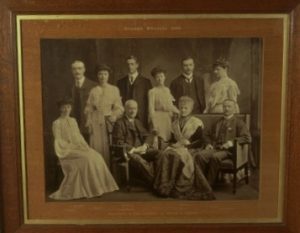 Look out for a photograph showing Henry Ulick (1831-1913), the Fifth Marquess of Sligo, with his wife, Catherine Dicken, and eight of their ten children, all assembled for the first time in 1904. Well, sort of…. It turns out that one of the children was unable to make it, and was ‘added in’ to the photograph later. Can you spot which one? The photograph was taken to celebrate Catherine and Henry Ulick’s golden wedding anniversary. Henry Ulick succeeded to the title in 1903, on the death of his brother, John Thomas, the fourth Marquess. Open Daily from 10am to 6pm, book your tickets here. Looking to stay over? 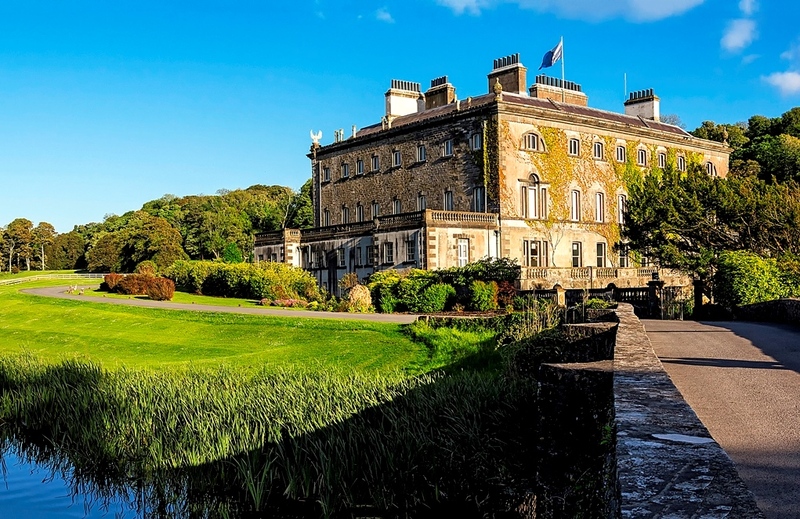 Why not check out our very own four star Hotel Westport situated a short 7 minute walk from Westport House and right on the front lawn.